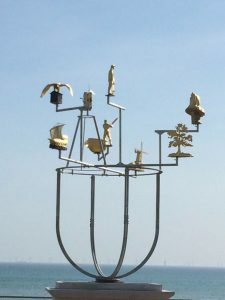 A real party atmosphere on the seafront marked the launch of the Hove Plinth and its inaugural sculpture, Constellation, by Jonathan Wright. You’ll find the Plinth on the King’s Esplanade, end of Grand Avenue, Hove. I have been the sculptural advisor since the start of this Hove Civic Society project, lead by Karin Janzon.